Home / Why Allied Document Solutions? 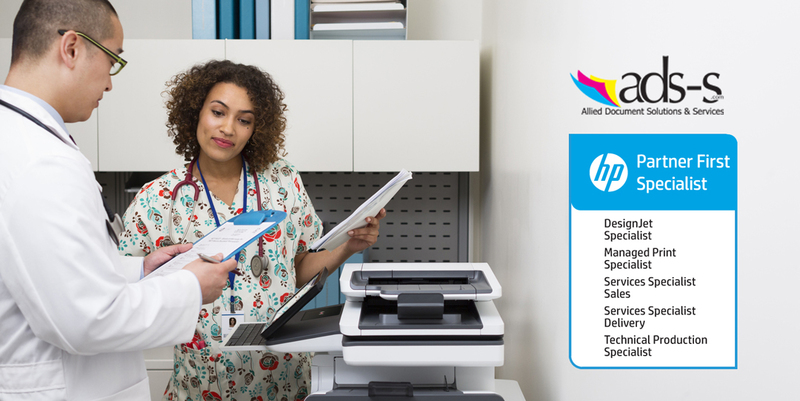 Doctor and nurse discussing hospital charts printed with a HP PageWide Enterprise Color MFP 586z. Why Allied Document Solutions and Services? ads-s is your premier managed print services provider. Your business needs a managed print services partner that will work with your business, not simply sell the latest trendy device or gadget. Our approach provides an objective assessment of your current print environment, recommendations for improvements, and expertise to implement and maintain for the best return on your investment. Business Technology Association (BTA) board2016/2017 President-Elect Rob Richardson. Founded in 1926, the Business Technology Association (BTA) serves office technology dealerships, resellers, manufacturers, distributors and service companies. Gloucester County Association of School Business Officials – Member June, 2016.
ads-s is more than just a printer repair services company. We are the best managed print services partner no matter what size your business may be or what types of printers and devices you utilize. Our focus is on improving your business bottom line and your productivity so that we can have a long term partnership with your company.